Breaking News! 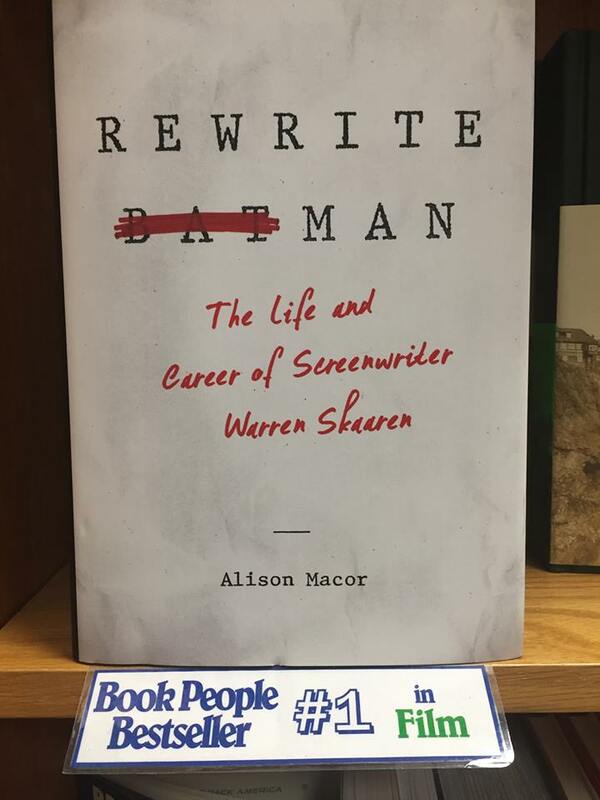 Rewrite Man is BookPeople's top seller in Film as of July 30, 2017. (Date: September 27, 2013) Gunnar Hansen was "fresh out of graduate school" at the University of Texas when he signed on to play Leatherface in The Texas Chainsaw Massacre, which began shooting in and around Austin in August of 1973. Today he lives on the coast of Maine and has been working as a professional writer (magazine articles, books, screenplays) for many years. Recently he was in Austin to talk about his new book, Chain Saw Confidential. We met for coffee and pancakes at Kerbey Lane, where Gunnar discussed the book's long gestation, why he loves Chinatown, and some of Leatherface's most surprising fans (hint: they drive big rigs). Q: Unlike some other books about the movie, Chain Saw Confidential includes interesting insights about the film's acting and what was required of the actors. Did you always plan to focus on this aspect of the production? GH: The great thing to me was that I got to hear other people's perspectives, things that I had no clue about. I knew that Marilyn [Burns, who played Sally] suffered, but when I was making this movie, I was thinking, "Stop complaining." Only when I did the interview with Marilyn did I understand how excruciatingly painful it was for her because of what they did to her. So that was the revealing thing for me about the interviews. To see it from each person's perspective. So I was glad that I made that decision. Q: How and when did you decide to write this book? GH: I got approached to do the book probably 15 or 20 years ago. Titan Books in England asked me to do the book, then I had a conversation with University of Texas Press because of their interest in Texana and film, but the problem was I think both the publisher and I conceived of the book as much smaller than Chain Saw Confidential. It was in fact my story. The big change, and why I thought this book would be doable as a real book, was because I realized I needed to interview everybody so that the book would be broader in the sense that I could talk about a lot of stuff that I had nothing to do with, and deeper because I had new perspectives on things that I already knew or thought I knew. Plus, my decision to talk about the larger context (the reception of the film; the editing, which I knew nothing about; popular vs. critical reaction; and the whole process about what horror is and how Chainsaw fits into that) really allowed me to make the book bigger. Q: When I show The Texas Chainsaw Massacre to my students, they often sympathize with Leatherface and his family and resent the film's younger characters for invading Leatherface's home. Does that surprise you? GH: I think that's part of the power of the movie. It is morally ambiguous. The standard view is that you've got the young people who are the protagonists, and this antagonistic family basically destroys them. But you can look at it the other way where the family is the protagonist, and the antagonists are the kids who invade this sort of normal balance. They throw everything off balance for the family. People love Leatherface, which is a little beyond me, but I can understand the sympathy for the character. Q: The time you've taken to write the book seems to have given you an interesting perspective on the film and its place in culture, which you discuss in the book's final section. Why was it important to include that context? GH: In a way the part of the book that was the most fun to write but also the scariest was the last two or three chapters because up to that point, I really was just laying out a narrative. I had to synthesize the narrative to some degree but essentially it was a decision about how I was going to frame the story that I was going to tell. I already had the framework because I had my memory of the story, and I just built it on the scenes as you watch them in the movie. But the last part is very different because there I had to learn a lot and then synthesize the theory and try to support that theory with the facts. Q: Did you write the book chronologically? GH: I did. I wanted the whole story of the movie to be very much intact in my mind when I went to write this last part so that I could really make this argument coherent and really base it on the film. I had this idea that I was going to talk about the film like it represented the end of the world. I talk about all of these things that are on the radio [at the beginning of the film], so I laid the foundation for that very early on by talking about the horoscope and by talking about some of the things that are being said in the movie. That's mentioned probably three times in different chapters, some piece of that, before I get to the chapter where I just go through all of these signs of doom and establish that at a certain level, [the horror] is supernatural in the sense of, the stars are out of alignment. Chekhov said, if there's a gun on the mantle in the first act, somebody better fire it in the third act. My feeling is it's the other way around: If somebody fires a gun in the third act, you better see the gun in the first act. In one of my favorite movies, Chinatown, you're actively recruited to constantly figure out what's going on [as in Chain Saw Confidential], but of course you're not rewarded in the end, you're just made to discover that you're completely wrong. Q: Any part that surprised you while doing the book? GH: I think some of the fights at the production level. I didn't know anything about the squabbles and the tension over the shot list. I was there but I didn't realize that there was all of this tension and these issues about getting the shots, and the business of [director] Tobe Hooper finally telling [cinematographer] Daniel Pearl , "That's just a list I made up." Q: I'm working on a biography of Warren Skaaren, who was the producer's representative for Chainsaw Massacre. In his archives, I found an audio recording of someone involved with the film interviewing one of the Wisconsin police officers about what it was like to find the victims of Ed Gein, the farmer who was a murderer and grave robber. Gein is also said to be the inspiration for Leatherface. Did Tobe Hooper or Kim Henkel ever mention this interview? GH: I remember so clearly when I asked Tobe and Kim about their inspiration for Leatherface, one of the first things Tobe mentioned was Ed Gein. But he made it really clear that Gein just inspired one aspect of Leatherface, so it's surprising to hear that. I'm trying to get rid of the myths, and the problem is, some of the cast and crew embellished things, so I had to have good sources. Because almost everybody involved with the production mythologized some elements of their participation, and it was so hard to distinguish [between fact and myth]. And I felt like I know that some of what I've reported isn't true, but I don't know what parts are, so I just tried to be very careful about what I put in. I wasn't very interested in the money [the film's profits, which has always been a hotly contested issue]. Even though I have to talk about it in the book, it's not fundamental to the story. So that's why I say in the book, what you think of this movie and whatever this movie is, have nothing to do with what happened to the money afterward. But, because it's so much a part of the myth, I think it's appropriate to at least tell what I know. And that's why that chapter's very short! Q: In promoting the book, has anything been surprising to you? GH: There will always be a Chainsaw Massacre fan audience for this book. I was trying to make the book "bigger," so that anyone who is interested in film would be interested in this book. I've been surprised how many very mainstream media elements are very interested in the book. I even did an interview for a Sirius radio show for truckers, who apparently love the film. The best part has been the strength of the reaction. Q: The photographs are terrific. They convey another kind of energy alongside the writing. Do you have a favorite photo? GH: The last photo is my favorite. [The group shot of Leatherface and his family sitting on the front porch] just sums up the experience of making the movie. Every one of us has an attitude in that photograph, even Grandpa: "Don't mess with us!" (Date: February 2011) CHAINSAWS has won the 2012 Peter C. Rollins Book Award! The award is given annually by the Southwest Texas Popular Culture and American Culture Association "to the 'best' book in popular culture studies and/or American culture studies" and is "designed to reward genuine research and lucid expression." "Macor sketches an intriguing flow-chart of like-minded Austin eccentrics who built an economic base for the city.... the book's strength is its enduring relevance . . ."
Keep an eye out for professor, author and former freelance Statesman film critic Alison Macor's definitive history of Austin film, "Chainsaws, Slackers, and Spy Kids: 30 Years of Filmmaking in Austin, TX," hitting shelves in March from University of Texas Press. The 346-page tome chronicles the people and movies that put our burgh on the celluloid map, from Tobe Hooper and Eagle Pennell to Richard Linklater and Robert Rodriguez. It drops in on the city's surplus of film fests, the Austin Film Society and the Alamo Drafthouse phenomenon. Indispensable.